Vasant Panchami is a spring festival and an auspicious occasion for Hindus. While the festival is celebrated differently all over India, the goddess Saraswati is worshiped in most places. 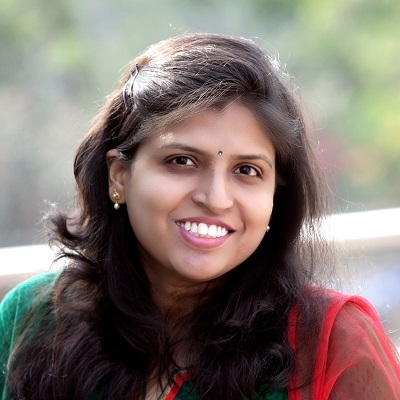 Yellow features prominently during Vasant Panchami, with people wearing yellow clothes and even eating yellow foods! 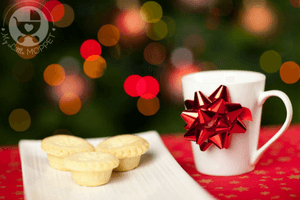 As with all Indian festivals, the food is a big deal here too, and many sweet treats are made and offered as Naivedhyam to the deity. 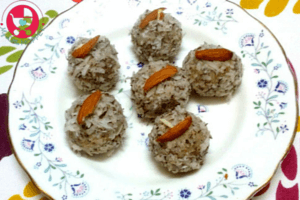 So we’ve got one such yummy dish for Vasant Panchami that is truly heavenly – khoya kesar laddu with desiccated coconut. The saffron adds the mandatory yellow, so everything’s taken care of! 1. Heat a heavy bottomed pan on a medium flame. Add the crumbled khoya to it and cook, stirring continuously till it is soft. 2. Add jaggery powder to it. 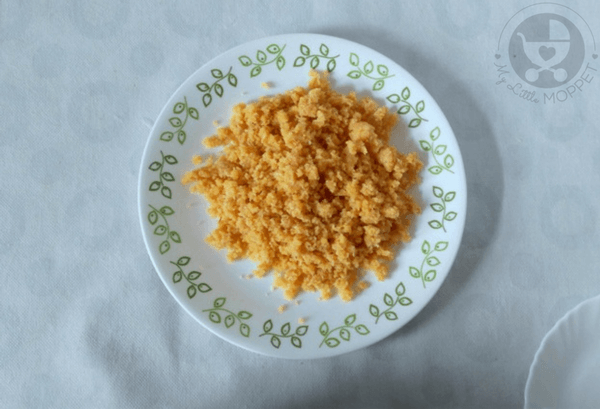 Mix the jaggery well with khoya and cook on a low flame. 3. The jaggery will melt and the mix will be semi solid. At this point, add the saffron milk and stir. Cook the mixture on low flame for another 2-3 minutes. 4. Add the desiccated coconut and mix everything thoroughly. 5. Keep stirring and cook until the mixture leaves the sides of the pan. 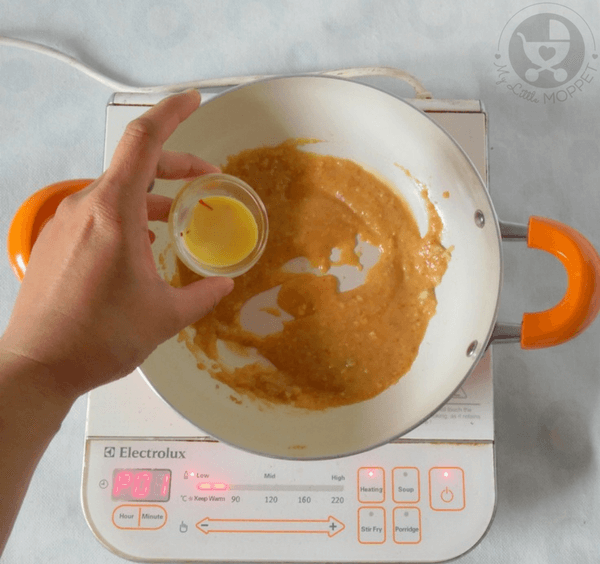 Overcooking the mixture will result in hard and chewy laddus, so be careful. 6. 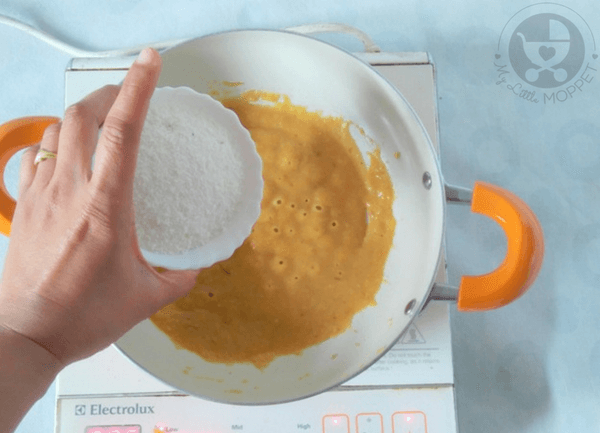 Turn off the flame and remove the laddu mix to a plate. Let it sit till it’s cool enough to handle. 7. Take a small quantity of the mix in your palms and bind it together. Roll it to make a laddu. 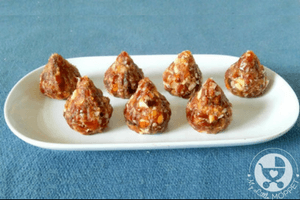 Make all the laddus similarly. 8. 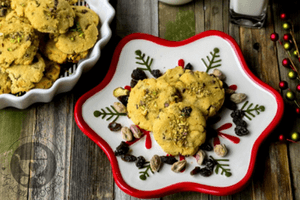 If you like, you can add pistachios or any other nut like almonds or cashews to garnish the laddus. 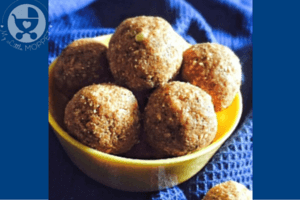 This khoya kesar laddu recipe is suitable for kids over the age of two. 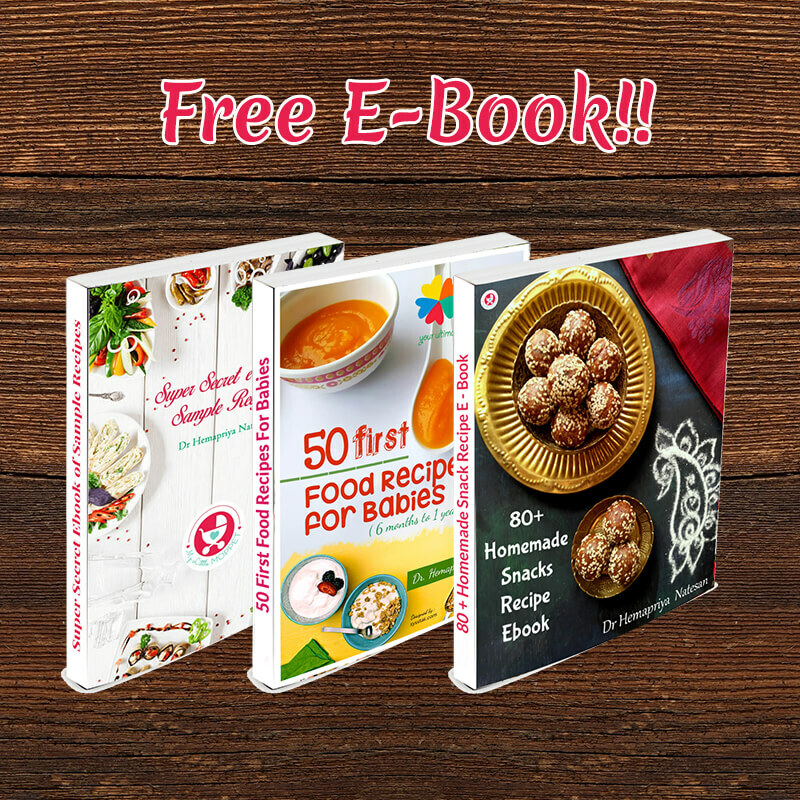 The laddus will last for 2-3 days at room temperature, although they taste best on the day they are made. 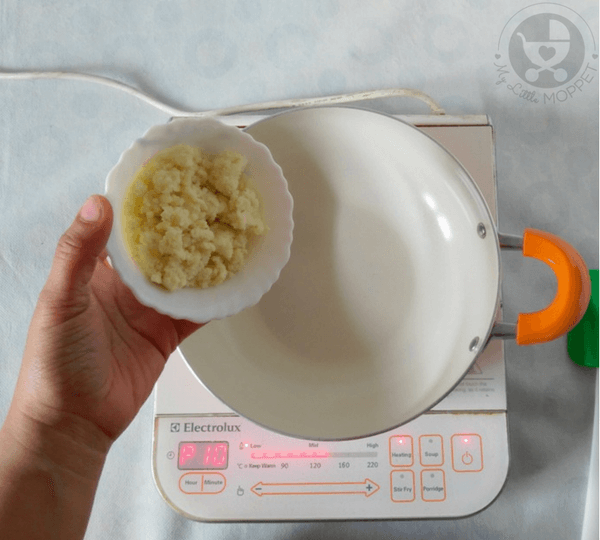 Use homemade khoya for best results. Not only is it safe and adulteration-free, it also takes the dish to another level! 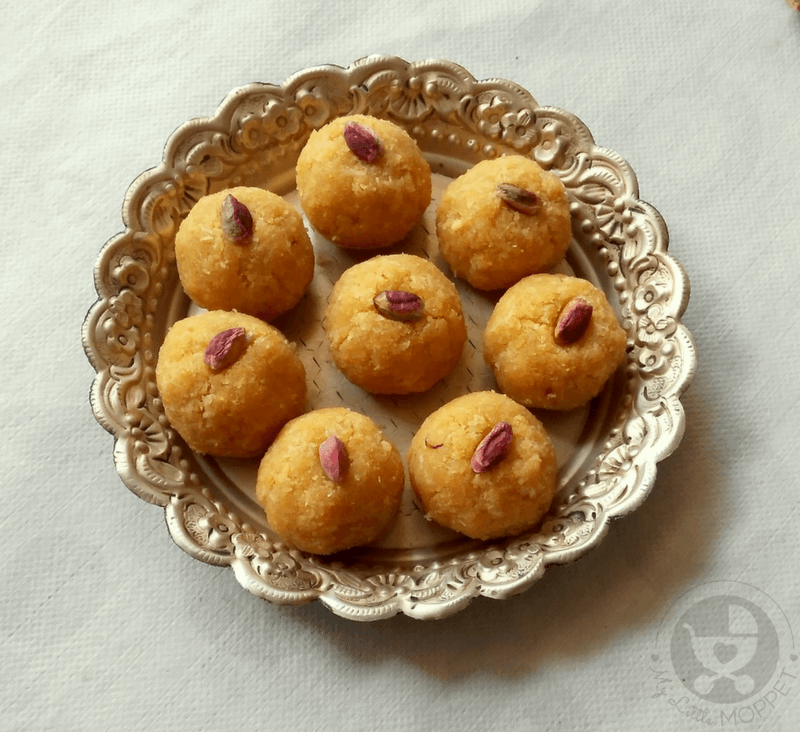 Saffron lends a beautiful golden yellow color to the laddus making them perfect for Vasant Panchami. So bring out your yellow clothes and get ready to welcome spring in this cheery color! . 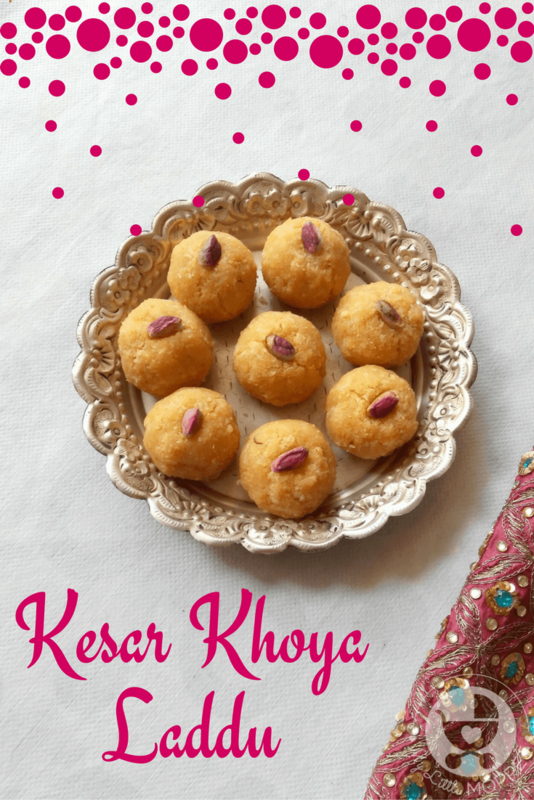 Traditional khoya, nutty coconut and beautiful saffron come together in this delightful festive dessert - Khoya Kesar Laddu Recipe for kids! Heat a heavy bottomed pan on a medium flame. Add the crumbled khoya to it and cook, stirring continuously till it is soft. Add jaggery powder to it. 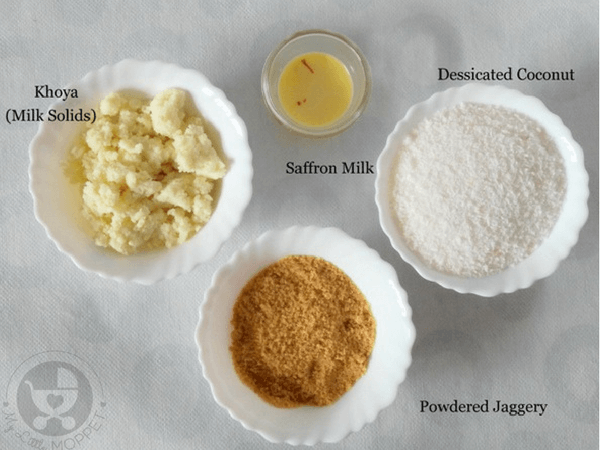 Mix the jaggery well with khoya and cook on a low flame. The jaggery will melt and the mix will be semi solid. At this point, add the saffron milk and stir. Cook the mixture on low flame for another 2-3 minutes. Add the desiccated coconut and mix everything thoroughly. Keep stirring and cook until the mixture leaves the sides of the pan. 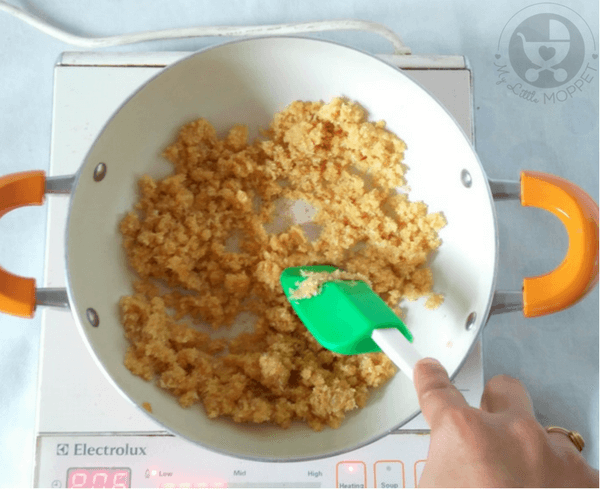 Overcooking the mixture will result in hard and chewy laddus, so be careful. 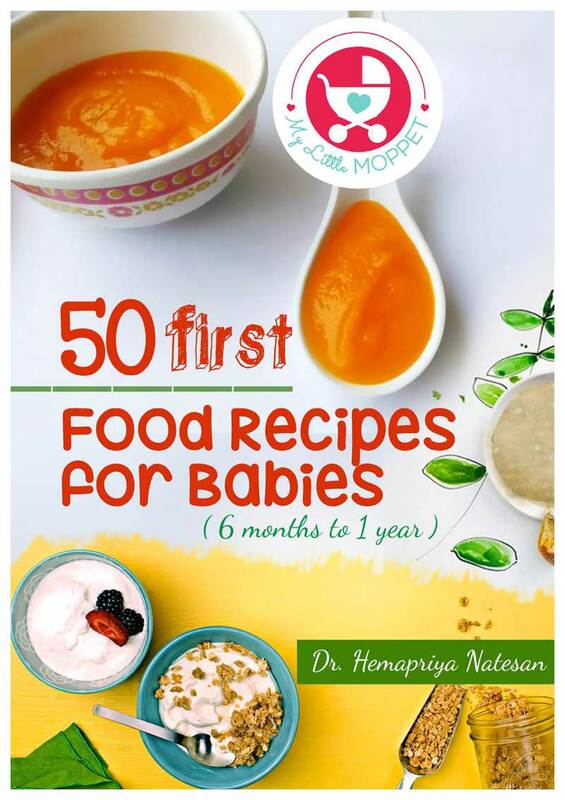 Turn off the flame and remove the laddu mix to a plate. Let it sit till it's cool enough to handle. 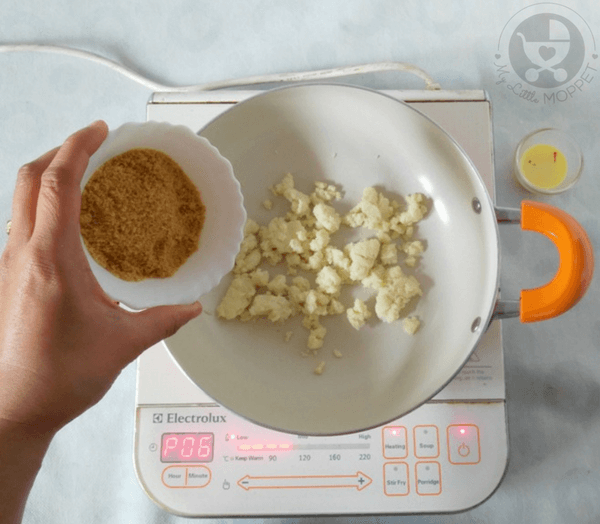 Take a small quantity of the mix in your palms and bind it together. 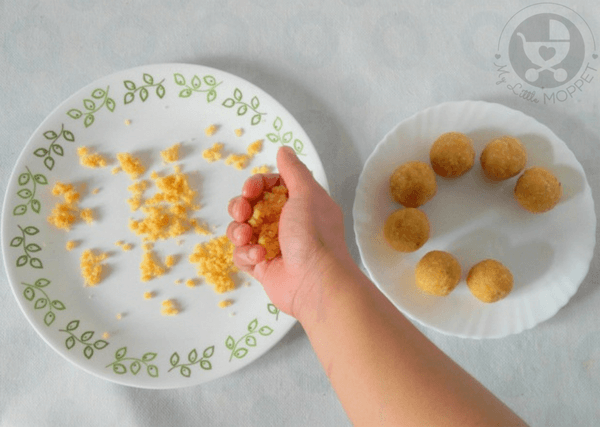 Roll it to make a laddu. 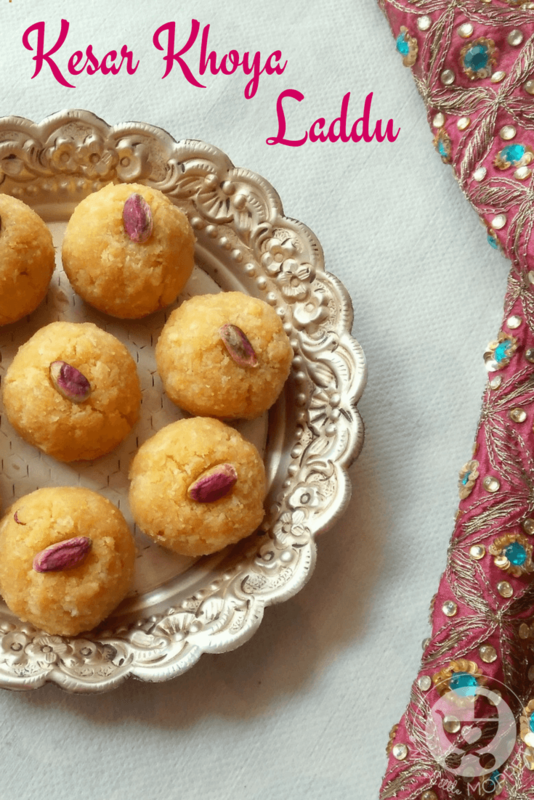 Make all the laddus similarly. 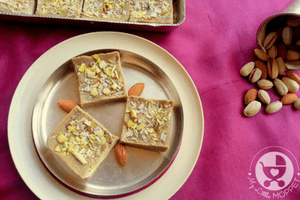 If you like, you can add pistachios or any other nut like almonds or cashews to garnish the laddus.